Can you imagine, as a child perhaps, being promised something and never paying attention to what the promise is? Most kids will pretty much never let their dad forget the ice cream he promised, or the puppy, or the special time together. And they will never ever forget what it felt like when he didn’t keep a promise. Even the best dads will sometimes fail and not perfectly keep all the promises they make to their kids. But your Father in Heaven never fails. When we look at our circumstances with our naturally myopic eyes we sometimes believe that God has not kept or will not keep His promises to us. We need to ask ourselves a few questions though. First, was that really a promise He made or am I confusing my wishes, hopes, and aspirations for promises? From the greatest to the least of us, we are all prone to cling tightly to what we want. Often we can find ourselves believing the lie that God owes us what we want, because we felt a sense of certainty that He wanted for us, what we wanted. Perhaps a friend or a pastor even told us that they heard from the Lord that something we wanted was assuredly going to come to pass, some good and lovely desire of our heart. They may have the same desire as you, and they can join you in entreating the Lord. May I suggest this is a place for caution? Friends, these deep desires we have must not be confused with the promises of God. 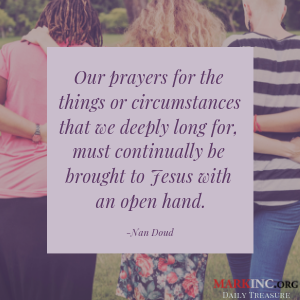 Our prayers for the things or circumstances that we deeply long for, must continually be brought to Jesus with an open hand. How can we cling to the feet of Jesus if we come gripping tightly our list of desires that so easily morph into demands? Second, do I believe that God’s willingness or ability to keep His promises to me are dependent somehow upon me and my ability to please Him? Nothing we do or don’t do can twist the arm of God. No list of sacrifices we’ve made for Him, no good we have done or vice from which we have abstained. Nothing at all can wrench from God’s hand that which He is withholding for a time or forever, and nothing whatsoever can prevent Him from bestowing the good and perfect gifts He has prepared in advance for us. We can no more control the faucet of God’s promise-keeping than a tiny child can beat their dad at arm wrestling. What we often fail to grasp is also this: He desires to bless us simply because we belong to Him. Functionally, we think we have to pry His fingers loose so that He will relinquish His promised blessings. The fact is, He already has our flourishing in mind. The trouble is that we very commonly have mistaken definitions of blessing… joy… peace. We need them redefined in light of the Prince of Peace, who was also called a Man of Sorrows. Many years ago a wise counselor pounded this into my head on an almost weekly basis: Get under the promises, Nancy. He challenged me to think about what I was going to believe. My hopes? My wishes? My fears? My bad dreams? Believing my hunches and hopes that God might just so happen to want the same thing I want (which certainly feels like an enormous stroke to my ego… “Heh… I figured out what GOD wanted! !”), even when they are good and holy desires in and of themselves, is not actually the same as believing God’s real promises. Are you believing what you want from God, or are you believing God? Getting this straight will not spare you all sorrow. You are, after all, following the Man of Sorrows. But it may help you know more intimately the One whose desire it is to bless you even when You are in a desert place. Get under the promises, friend. Here are a few that I read in an encouraging devotional the other day. May we rest in Your promises today. Father God, help us to understand the difference between believing what we want from You, and just believing You? Help us to get “under the promises”, and help us to grasp how You desires to bless us simply because we belong to You.